Run for the hills when an online marketing person tells you “I guarantee traffic and/or a specific return on investment”. 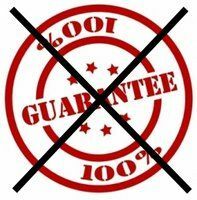 Online marketing professionals should never guarantee ROI and Traffic. WE DON’T CONTROL SEARCH ENGINES AND SOCIAL MEDIA PLATFORMS!! Every platform has their own algorithm that is constantly changing and NOBODY knows exactly how it works. Google, Yahoo, Bing, Amazon, Facebook, linkedin, Twitter, Pinterest, Instagram, and many more have their own agenda and algorithms. If you can’t control or know when algorithm changes, what exactly they are, and how does it affect your company then you essentially can’t guarantee results. Although confident in our skills and a track record of proven results, we don’t guarantee ROI and Traffic. 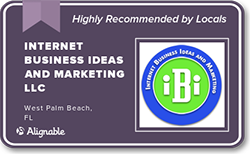 Internet Business Ideas and Marketing LLC is truthful, transparent, and in constant communication with our clients. At Ibi Marketing we communicate with our customers and set proper expectations. We educate them on our industry. We let them know of future changes that may happen so we can prophylactically treat the problem hence no big changes in rankings. Every month our customers get a detailed report that can be reviewed with your representative. I’m apologizing for all marketing companies that for centuries have guaranteed results to their customers. Sometimes marketing and sales are utilized interchangeably and that is because of the historically bad experience people have had. Ibi Marketing employees have previously worked in traditional media (radio, television, print) for years which allows us to intellectually speak about those platforms. Those industries have habitually promised results to customers that mostly can’t be delivered. This is disingenuous because those are broad stroke branding campaign and not a good tool for specific and tracked leads. Therefore, you can’t guarantee a Return On Investment. For example, you get a flier in the mail, you see the billboard while driving to work, you hear a commercial on the radio or tv, does that make you buy right now? 99%+ of the time the answer is NO. Your focused on getting the kids to school and not worrying about the attorney billboard. If you still listen to the radio you probably changed the station away from the commercial to hear more music on another station or you’re on your phone. If you are not streaming a commercial less program and watching regular tv, you may have changed the channel during commercial or used it as a bathroom break. When someone comes home from a long day at work and get their mail, the first they do is throw most of the junk in the recycling bin. Bottom line most people are not interested in that product at that specific point in time. However, with online marketing your potential client has taken time to “Google” what they are looking for and our goal is for your ad to be seen. When they see your ad they click on it and go to your website to fulfill their needs. These are potential customers who are further down the buying chain. Bottom line is that online marketing is the most inexpensive, targeted, and tracked marketing platform that can reach the most people.